Many folks have issues with at least some sections of their lawns. South-facing exposures tend to suffer the most in the summer. In some ways, it's unrealistic to expect our lawns to stay perfect throughout the year. The biggest issue, though, tends to be the amount of water used and the cost in keeping the lawn green. If you decide to remove your lawn, here are some techniques to consider. Manual removal works well for smaller areas. These pictures show the technique done with an edging shovel. You can also rent a sod cutter. As you can see, the sod is cut off into pieces similar to pieces that would be bought. Rolled up like a carpet, it's easier to carry off these pieces. It's important to mark any sprinkler heads so as not to damage them. After all the sod is removed, you will need to make up for the net loss of soil by bringing in about two inches of topsoil. 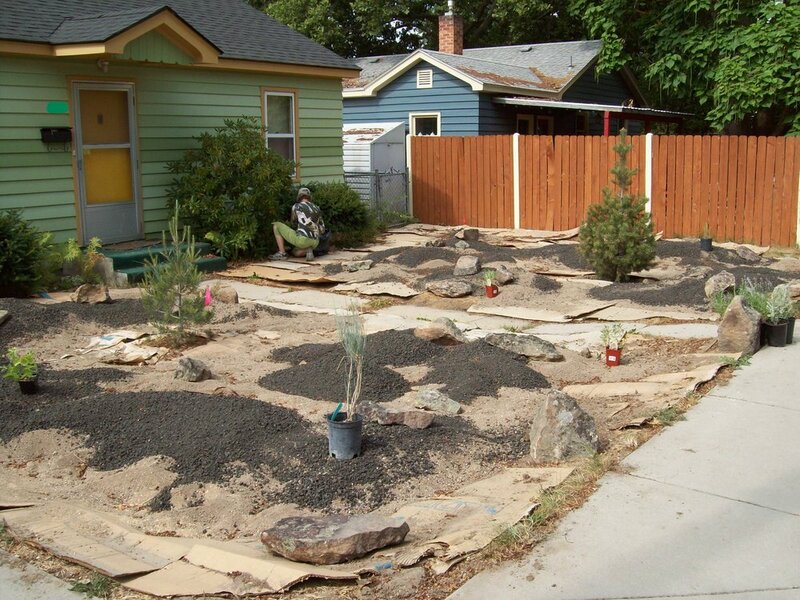 At this point, you might consider bringing in more to create some topographical features, i.e., berms. Here are two smothering techniques. In the picture on the left, we used tarps to not only block the sunlight but moisture as well. Ideally, leave this on for four weeks. In the picture on the right, we turned off the water in the summer to let the turf die back hard. Then, we layered thick cardboard (or six layers of newspaper) over the entire area. Care must be taken to weigh down the edges of the cardboard. An advantage to smothering is that nothing is taken away, so no soil needs to be replaced. This saves on costs and labor. In the right-hand picture, however, we brought in soil to create some small berms. After, we can plant through the cardboard, leaving it to help keep the weeds down. Herbicide treatment can be the quickest way to kill turf. Timing is everything. Herbicides work better in warmer weather, but need to be used responsibly on dry days with no wind. Generally, multiple applications are necessary to completely kill the turf. With this technique, similar to smothering, no additional soil needs to be brought in. We do usually weed-whack all the dead turf off prior to planting.